Its a cracker of a day in New York City. Bright, Sunny with a cold crispy breeze. Which makes one want to grab a cup of coffee and just sit and enjoy the usual hustle and bustle of the city. And as you let your mind wander into myriad thoughts, if you end up meeting people and get to talk to them about what to do and what to see in your home country (in my case India), then its even better. I just had a great conversation with three people, one of who (lets say JB) is planning to visit India in February. As i took a seat at a table next to them, i overhead them talk about India and they had guide books (frommers, lonely planet). One of them had visited Delhi in 2007 and was sharing her experience and delight of visiting India. I ventured to give them some tips based on my own experiences in Delhi and other places. And it turned out to be a great conversation. Now two weeks is not at all sufficient to experience India, as is JB's duration of the visit (in which he plans to go to Delhi and attend a wedding in Jaipur). I have lived in India till i was 25 but have only seen or experienced so much. But even though its not the full gamut, what most guide books don't have are the small details of a place or the ability to convey an experience, many of which i have had. And these are what i shared with my three new found acquaintances who clearly where very interested in knowing about things from someone who was from India. There is so much to do, see, eat, smell and touch in Delhi. 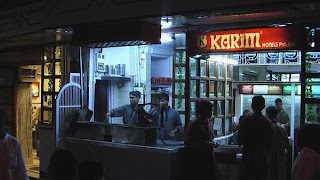 Where could i begin from other than talking about Karim's, the famous old Delhi restaurant (started in 1913) where i have spent countless nights savoring the best mutton (goat meat) burra (roast mutton). Karim's was started by the grandson of the chef who cooked in the royal kitchen of the last Mughal emperor of India. There is something about Karim's food - the richness of their taste, the authenticity of their setting (the restaurant is ensconced in bustling old Delhi market) and the consistency of their cooking, that makes one want to go again and again. "If you happen to visit Karim definitely try the mutton burra (see another testimony), the mutton korma (mutton curry cooked in rich spices) and the Naan (indian bread)", i told JB. And as i began to talk about the food, the more i vividly i could remember and thus describe my experiences in Delhi. I did however, warn John that getting inside old Delhi is an arduous task - its a crowded marketplace (with a stretch that reeks of rotting fish ). 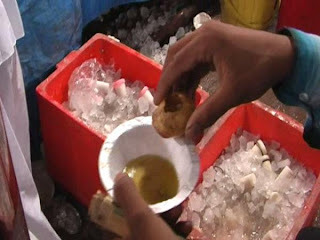 But it has its rewards, like watching the numerous street vendors selling kebabs, rice pudding (kheer) and other goodies. And of course the reward of getting to eat Karim's food which as the restaurant says, "The secret to good mood, is Karim's food"
Since i am quite a foodie, i couldn't stop from talking more about it (and also how i ended up getting iFood.tv off the ground with some friends). 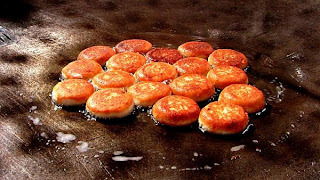 Like recommending JB to definitely try some of the unique and just delicious snacks and sweets at Haldiram's a very popular (and deservingly so) chain of Indian snack food restaurants. Haldiram's is a story in itself. From its panipuri, raj kachori, dhoklas, aloo-tikki (cutlet)to the rasmalais and other goodies, the list is endless (see pics below). I have often wondered why they dont have a branch here in New York - perhaps bang at times square. America hasn't yet been introduced to the goodness of indian snacks and sweets. By now my friends were also beginning to feel hungry! And as i talked about other things to taste, how could i forget the frozen paan sold on Rajpur road in delhi. I can only describe this as a mouthful of tantalizing tastes and an experience all on its own. And from there to Hardwar, the town where the sacred river Ganga enters the plains in all its rushing might. I hope John can make it there and take a dip in the river - no matter how cold the waters. its worth the effort. And to reward yourself, you can fill up on aloo-puri (a popular Indian snack) at the adjoining bazaar and then top that with a glass of heavenly lassi at the Prakash Lassi shop. And from Hardwar we even went further north upto Ladakh, the mystical land, up at the northern tip of India bordering Kashmir, Pakistan and Tibet. Funny how quickly and easily the mind can condense vast spans of time and geographies (i had visited Ladakh when in 4th yr of medical school in 1998, but i still vividly remember the cup of tea with yaks butter in it ). By now all of us seemed to be immersed in our own imagination of this land far away - of this country with these myriad tastes, smells and sights, people and stories. We traversed trough our mindscape from the North to the West, where JB is headed to the capital city Jaipur of the royal state, Rajasthan, for a wedding. I hope JB can get there in the train, on a regular class ticket. I have always loved the trains in India despite their ordeals. I had to stop somewhere. In two weeks, JB can only do so much and to give him all these visions would only make his heart desire more and expect more. I had to ground him in the realities too. For India comes at you in different ways. There is the excitement and fantasies that one begins to create reading books, hearing stories and sometimes watching Bollywood or movies showing aspects of India. But then there is no 'One India'. There have never been one. India reveals itself as one wants to see and experience it. It is a kaleidoscope and i told John he should be prepared to face the ugly with the beautiful, the desperation with the satisfaction and the chaos with utter serenity and peace. And of course, my experiences are just another snapshot of time and perspective.